Includes for the first time in one collection every known Elvis Presley Sun master and outtakes, plus two private records Elvis Presley paid for with his own money, as well as thrilling radio and concert performances from the period. This 3 CD package features 10 previously-unreleased cuts. The accompanying book written by Ernst Mikael Jørgensen, is in essence, a fully-illustrated travelogue. It thoughtfully details the birth of Elvis Presley's career through facts, anecdotes, documentation, many rare photos, and a succinct narrative. Independence Day 1954 is when this uniquely American saga begins, less than 24 hours before his first professional recording session, and it ends in December 1955, when the rights to Elvis Presley's Sun tapes officially expire, and the singer leaves Sam Phillips to record for RCA. This is Elvis Presley before he becomes world-famous, and the mystery of how this amazing young man readies himself for stardom, achieving success on a level that no one could have dreamed possible. All audio has been re-mastered and restored best as could, but Disc 3 has pretty rough audio. The book is 512 pages in 12'' by 12'' format and includes more than 500 photos of which about 200 are previously unpublished. If you are not an expert in this period of Elvis Presley's career, a lot more photos will be new to you. Many familiar photos will be seen in best ever quality, but since this is a historical document, there will also be many images of less quality, included for their rarity value and support of the story. The book also includes, for the first time, Steve Sholes’ original notes on the Sun tapes. The project will come in a slip case that holds both the book and the CD holder, a double album type package. 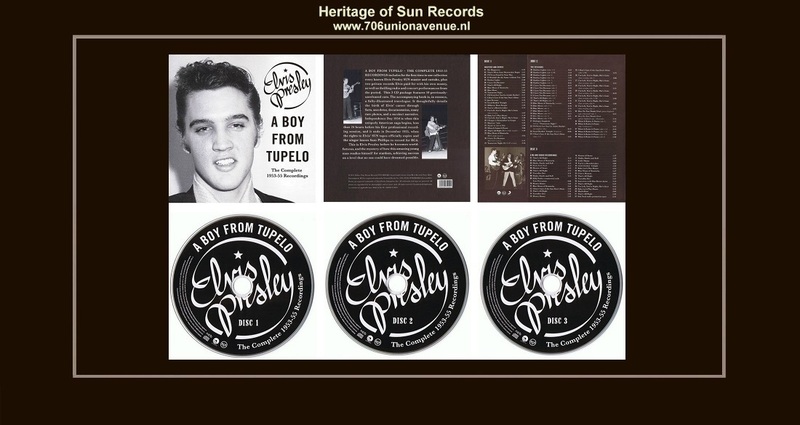 ''A Boy From Tupelo'' August 3, 2013 Follow That Dream 506020-975049-1-2-3 is Sold Out!